Cellular respiration is a set of metabolic reactions and processes that take place in the cells of organisms to convert biochemical energy from nutrients into adenosine triphosphate (ATP), and then release waste products. The reactions involved in respiration are catabolic reactions, which break large molecules into smaller ones, releasing energy in the process, as weak so-called "high-energy" bonds are replaced by stronger bonds in the products. Respiration is one of the key ways a cell releases chemical energy to fuel cellular activity. Cellular respiration is considered an exothermic redox reaction which releases heat. The overall reaction occurs in a series of biochemical steps, most of which are redox reactions themselves. Although technically, cellular respiration is a combustion reaction, it clearly does not resemble one when it occurs in a living cell because of the slow release of energy from the series of reactions. 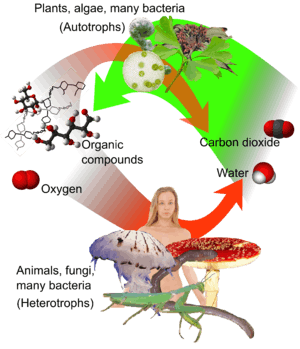 This is also called the Krebs cycle or the tricarboxylic acid cycle. When oxygen is present, acetyl-CoA is produced from the pyruvate molecules created from glycolysis. When oxygen is present, the mitochondria will undergo aerobic respiration which leads to the Krebs cycle. However, if oxygen is not present, fermentation of the pyruvate molecule will occur. 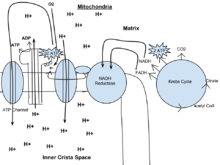 In the presence of oxygen, when acetyl-CoA is produced, the molecule then enters the citric acid cycle (Krebs cycle) inside the mitochondrial matrix, and is oxidized to CO2 while at the same time reducing NAD to NADH. NADH can be used by the electron transport chain to create further ATP as part of oxidative phosphorylation. To fully oxidize the equivalent of one glucose molecule, two acetyl-CoA must be metabolized by the Krebs cycle. Two waste products, H2O and CO2, are created during this cycle. The citric acid cycle is an 8-step process involving different enzymes and co-enzymes. During the cycle, acetyl-CoA (2 carbons) + oxaloacetate (4 carbons) yields citrate (6 carbons), which is rearranged to a more reactive form called isocitrate (6 carbons). Isocitrate is modified to become α-ketoglutarate (5 carbons), succinyl-CoA, succinate, fumarate, malate, and, finally, oxaloacetate. 1 2 3 Rich, P. R. (2003). "The molecular machinery of Keilin's respiratory chain". 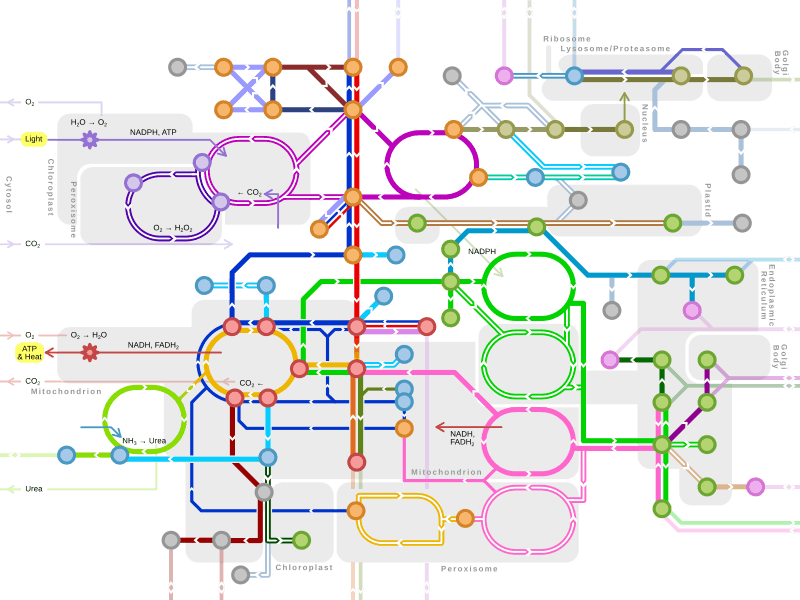 Biochemical Society Transactions. 31 (Pt 6): 1095–1105. doi:10.1042/BST0311095. PMID 14641005. ↑ Reece1 Urry2 Cain3 Wasserman4 Minorsky5 Jackson6, Jane1 Lisa2 Michael3 Steven4 Peter5 Robert6 (2010). Campbell Biology Ninth Edition. Pearson Education, Inc. p. 168. ↑ Porter, R.; Brand, M. (1 September 1995). "Mitochondrial proton conductance and H+/O ratio are independent of electron transport rate in isolated hepatocytes". The Biochemical Journal (Free full text). 310 (Pt 2): 379–382. doi:10.1042/bj3100379. ISSN 0264-6021. PMC 1135905 . PMID 7654171. 1 2 3 Stryer, Lubert (1995). Biochemistry (fourth ed.). New York – Basingstoke: W. H. Freeman and Company. ISBN 978-0716720096.